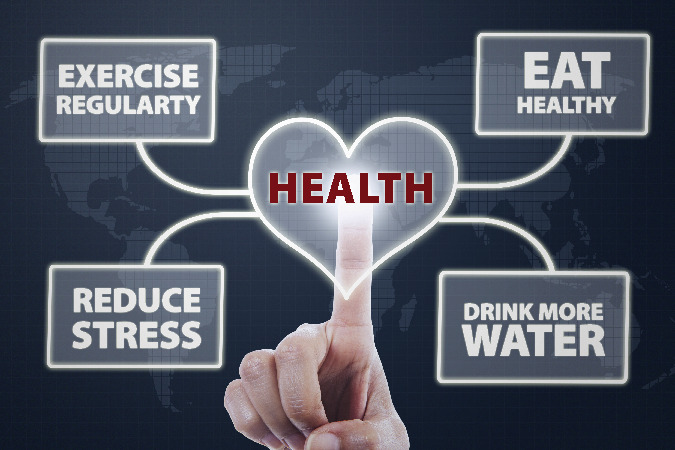 Health is more than just eating certain foods or exercising for a certain amount of time each day or week. If you are seeking overall health and wellness for any length of time, you will realize that the concept actually encompasses a range of attitudes, behaviors, and improved lifestyle. Wellness is about being whole, being yourself—really, being your best self. So how can you get there? Take a look at 3 healthy lifestyle tips to change the way you think, and the way you live. How may individuals with the best of intentions make their way to the gym on New Year’s Day, fresh with new-year resolution motivation … only for the luster to lose its shine before you can say “Happy Valentine’s Day” (or sooner)? Did you know, that statistics reveal that 67% of people with gym memberships don’t use them? Accountability isn’t a new concept, but it’s one that has become more lucrative in the health and wellness culture. Whether it’s a wellness program, health coach, an app or a fitness friend or neighbor, having someone or something to be accountable to, can keep the shine of a resolution from becoming dull and motivation to multiply over time. It makes sense that alongside accountability, tech would rank high in healthy lifestyle tips for wellness programs. Whether it’s a Fitbit, Apple Watch or other wearable tech devices, instant access to health vitals and fitness and nutrition has become an invaluable commodity. At Wellworks For You, we’ve seen first-hand how having a wellness portal that’s easy, accommodating and diverse in health and wellness capability, offers accountability, encouragement and consistency in seeking and maintaining daily health and wellness practices. Accountability and consistency are no doubt crucial in maintaining an optimal health routine, but there is something else to add of equal importance – variety. When they say “variety is the spice of life,” they must have been referring to health and wellness. Although some people may enjoy the peace and contentment that can accompany a fitness or dietary routine, many seek for the spice of diversity. If you do any research on the latest fitness trends, it’s not so much one, two or even three top types of exercise, it’s several. Whether it’s weight training, HIIT (High-Intensity Interval Training), Tabata, yoga, mountain climbing or sumo wrestling, switching up your fitness routine not only prevents boredom, but there’s more value added. Studies have shown that in terms of weight loss and management, the body actually responds better when introduced to variations of physical activity. Combinations of stretching, cardio and strength training each provide a benefit to the physical body while offering the mind the variety needed for motivation, mental health and clear thinking. The same can be said for eating healthy. At Wellworks, we empower people not simply with essential dietary information, but with a diverse offering of healthy recipes and meals. To experience wellness, it’s not just about what you do, it’s how you do it. If you’d like to learn more about wellness programs, we’d be happy to advise you. Call Wellworks For You at 800.425.4657 for more information.